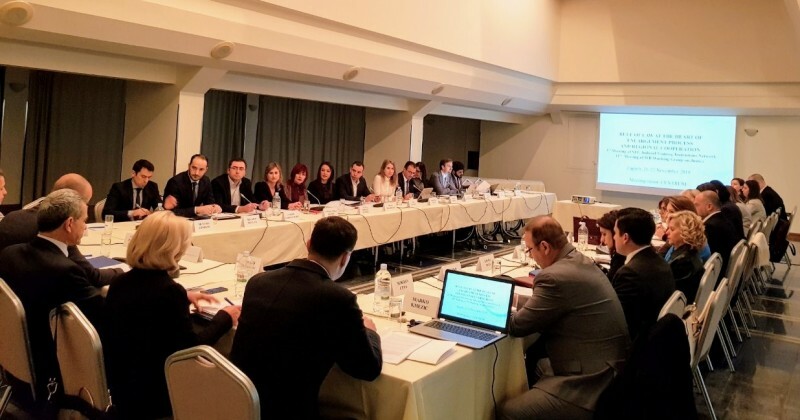 Zagreb – The Regional Cooperation Council (RCC) hosted the 3rd Meeting of the South East Europe (SEE) Network of Judicial Training Institutions “Rule of Law at the heart of enlargement process – regional cooperation”, in Zagreb, Croatia on 21-22 November 2018. The participants discussed the importance of improved regional judicial training as one of the key factors for ensuring the independence, accountability and efficiency of justice, as well as indicators and tools for its improvement. “Our annual survey of public and business opinion Balkan Barometer is constantly showing the low level of trust that citizens in Western Balkans have in judiciaries, as 76% of citizens in the Western Balkans say they do not trust their judiciaries and 79% believe that the law is not applied equally to everyone. We have to keep working on improving the judiciary in the region and to change this perception and regional cooperation is an important tool for that,” said Vesselin Valkanov, Head of RCC Liaison office in Brussels. The participants of the meeting concluded that the regional cooperation and exchange of good practices and lessons learned, as well as information about the results and reforms in the area of justice, will in long-term keep improving efficiency and competency of judges and prosecutors in SEE and support judicial reforms as prerequisites for enhanced independence and accountability of judiciaries and achieved high EU standards in the area of justice. The meeting, organized with the support of the Croatian Ministry of Justice, gathered representatives of high judicial and prosecutorial councils, ministries of justice, academy, and judicial training centres from the region, as well as representatives of GIZ, European Judicial Training Network, South East European Law School Network, and RCC as the host. The SEE Network of Judicial Training Institutions is a RCC’s regional platform for exchange of experiences and support to regional judicial trainings as a precondition for achievement of EU standards in the area of justice and rule of law. On 22 November 2018 the RCC also organised the 11th Meeting of the WB Working Group on Justice.